Welcome to Hello, Splendor‘s first ever Blog Crawl!! I can’t wait to hear everyone’s stories and how unique everyone’s approach is, but for now, here’s mine… I know I’m a nerd. But, just join in the fun anyway! That’s Me! I’m Beth Dotolo… Founder of Hello, Splendor, Principal Interior Designer of Nest Interior Design, Wife, Mother, & friend. My story takes place in Dallas, Texas, but spans the blogosphere and verse as I meet new friends and form my ‘clan’. That’s me! I kinda loathe Bella, but, she’s the star of the story. Kevin is my Edward & Maxton is the sweet little man that makes my world go round! Lauren (aka Aspiring Kennedy) is my spunky, always enthusiastic, and loyal friend! My best friend Carolina is really only likened to Rosalie for her good looks and honest outlook. The rest of my vamp clan, especially here in the blogosphere, is Laura (aka Something Legit), Kelly (the oh-so-fabulous Fabulous K), Heather (the amazing Social Thread), and Michelle (designer of Studio Surface). My wolf pack consists of the fabulous Grant (aka Cashmere Cowboy) & my amazing assistant Matthew (@ervincowboy). The plot in my story is much like Twilight’s… A girl who is only human, struggling to find her priorities and a healthy balance. You could call my day job ‘The Voltori’ & my consulting job ‘Victoria’. Yes, I know I’m a dweeb… but, stay with me. As I said, I’m an Interior Designer by day. And, I’m a blogger, marketing consultant, wife, and mother by night. But, really, I am all of those things all of the time. I started pursuing a career in Interior Design about 8 years ago. I went to college, did my internship, got my license, and worked for a national commercial design firm. Interior Design is something that I’ve always been passionate about. When the firm I was working for went south with the economy, I knew that I didn’t want to pursue another job in a corporate firm environment. So, I approached the owners of an super chic boutique called Nest, and Nest Interior Design was born. I am currently the Principal Interior Designer there. I have some amazing clients and they keep me very busy! Thank goodness for my amazing assistant, Matthew! In the midst of building my career, I also met the man of my dreams! My Edward… except without all the angst. As a 6′-0″ woman, I had vowed never to date a man shorter than myself. But of course, I found the perfect man, wrapped in a 5′-5″ package. We married and now have a 9 month old boy, named Maxton. Max is the cutest, silliest, and most lovable little guy I know and he steals my heart everyday with his precious smile. You’ll see both of the men in my life featured here on the blog frequently. They are the core of my being, so it’s hard not to share! After Maxton was born and I was working full-time… from home, with Max by my side… I began to feel that I was giving so much of myself to my job, to my family, and I just wanted something for me. I wanted to be sure I didn’t loose touch with myself and I wanted to be able to connect with people in a different way. Having a child can definitely change your social pattern. So, I started a blog that I dedicated to modern living. Here I share all the things I love, whether that be products, spaces, my family, or my friends. It’s simply a place to share… and build a community. My story’s twist comes from the start of Hello, Splendor! I never knew how much I would come to love blogging and how many great friends I would meet. I’m only adding more to my pile of work, but it’s the one task that I really look forward to. It’s therapeutic and it’s like sharing a piece of me with friends! I am so glad to be here and so grateful that people are listening and playing along. to be continued… stay tuned! I want to give a huge THANK YOU to all of the incredible bloggers who are participating!! See the whole lineup here… It’s pretty impressive. 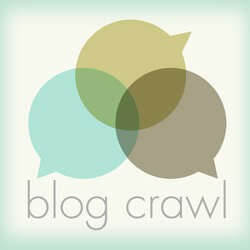 And, I’d like to thank Fabulous K & Studio Surface for helping me kick off the Blog Crawl today. Be sure to check out Bryn’s story tomorrow. I adore her and her amazing blog!